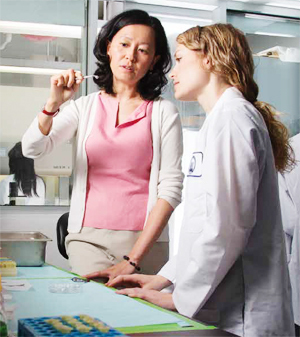 Given the breadth of Helen Lu’s tissue research around sports-related injuries and other bodily setbacks, one might think she is a busy MD rather than a pioneering engineer who has achieved White House recognition for advancing the field of soft tissue engineering. Lu, professor of biomedical engineering, and her research team specialize in tissue regeneration and are focused on growing multiple tissues to build functional organ systems that will assimilate with the body. Their main goal is to promote long-term healing and restoration of native tissue functionality. The group, which collaborates with Columbia and other New York–based doctors, currently is working on three projects related to orthopaedics and sports medicine—the repair of the anterior cruciate ligament (ACL), rotator cuff, and articular cartilage. They are also focused on two other ventures related to dental issues—periodontal repair and dental pulp regeneration. Stem cells on aligned nanofiber scaffolds. The cells are alive (green) and adhered along the long axis of the fiber, i.e., from the left to right side of the image. “We’re developing new ways to help the body heal after soft tissue injuries. Our approach is novel because it focuses on the regeneration as well as functional integration of the soft tissue graft, post repair or reconstruction,” Lu says. 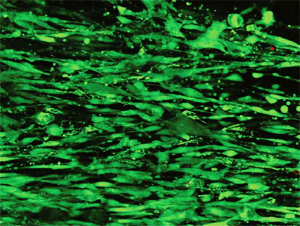 Their technique is important for these tissue-engineered grafts—tendon, ligament, and cartilage—to perform within the body. Once the grafts are in place inside the human body, they easily meld well with connective tissues. “Our holistic approach to soft tissue repair uses living, engineered components that can remodel to the physical demands they encounter,” explains Lu, who’s been teaching at Columbia Engineering since 2001 and is also director of Columbia’s Biomaterials and Interface Tissue Engineering Laboratory. Lu’s discoveries also aren’t age discriminate. She noted that unlike metal and plastic prostheses, these engineered tissues have the potential to grow with and adapt to meet the functional demands of both young and old physically active patients. Among her many projects, Lu and her team, in collaboration with Dr. Scott Rodeo at New York’s Hospital for Special Surgery, developed a novel “scaffolding” method to help ACL sufferers grow the three distinct tissue types within one functional system tissue-engineered, integrative interference screw. The innovative interference screw holds the ACL graft in place and lacks the disadvantages of traditional metallic implants. Lu’s own relationship with ACL technology dates back to when she was a postdoctoral fellow at Drexel University, and the development she worked on then is now in clinical trials in Europe. Lu’s group also developed another scaffolding technique—this one for rotator cuff injuries. They are presently seeking FDA approval of a nanofiber, bilayer scaffold applied as an inlay inserted between the tendon and bone to help the two adhere together. By contrast, conventional rotator cuff devices are applied as a patch over the tendon during surgery. Lu works with William Levine, professor and chair of Clinical Orthopaedic Surgery, and director of the Sports Medicine Department of Orthopaedic Surgery at Columbia, on the rotator cuff scaffolding design. One of the benefits of Lu’s interface tissue engineering is that the technology helps lower failure rates of traditional soft tissue grafts, and, in turn, saves the patient money. Since they’ve determined how to connect different tissues, researchers may ultimately regenerate a whole joint or eventually an entire limb in the future. Lu might have caught a glimpse of her own future in engineering during high school when she took an interest in math and biology and became fascinated by the concept of the human body as a machine. Now, she’s able to put her enthusiasm into motion. “I’m inspired by the opportunity to help many people on a large scale through our work, as well as the excitement of discovery and satisfaction gained in problem solving,” Lu says. Her achievements were recognized in 2009 when she was presented with the Presidential Early Career Award for Scientists and Engineers, the highest honor bestowed by the U.S. government on outstanding scientists and engineers in the beginning years of their independent research. Richard Skalak BS’43, MS’46, PhD’54 (1923–1997) was already a distinguished professor of civil engineering and engineering mechanics, specializing in fluids and oil extraction, before turning his formidable attention to bioengineering in the late 1960s. In a groundbreaking series of studies, many with Columbia colleague Shu Chien, Skalak was among the first to apply principles of engineering mechanics to understand the behavior of biomaterials. His 1969 paper, “Deformation of Red Blood Cells in Capillaries,” a collaboration with P. I. Branemark published in Science, precisely described and quantified the flow of red blood cells. Later research—published in more than 200 papers—delved into cell membranes, bone and soft tissue growth, immune response, and many other topics. Skalak also worked to develop titanium dental implants, contributing significantly to the broader practice of skeletal reconstruction. His work has proved foundational to advances in understanding and treating cancer, hypertension, atherosclerosis, and many other diseases. Having joined the Department of Civil Engineering and Engineering Mechanics in 1944, Skalak taught at the Engineering School for more than 40 years. He chaired the department from 1972 to 1975 and became James Kip Finch Professor of Engineering Mechanics in 1977. From 1978 to 1987, he was director of Columbia’s Bioengineering Institute. After retiring from Columbia in 1988, he directed the Institute for Mechanics and Materials as a professor of bioengineering at UC San Diego, passing away in 1997. Skalak, a recipient of the Theodore von Karman Medal from the American Society of Civil Engineers, was a member of the National Academy of Engineering, the American Society of Mechanical Engineers, and the New York Academy of Medicine. He also served as president of the Society of Biomedical Engineering. The School holds the annual Richard Skalak Bioengineering Lecture in his honor.